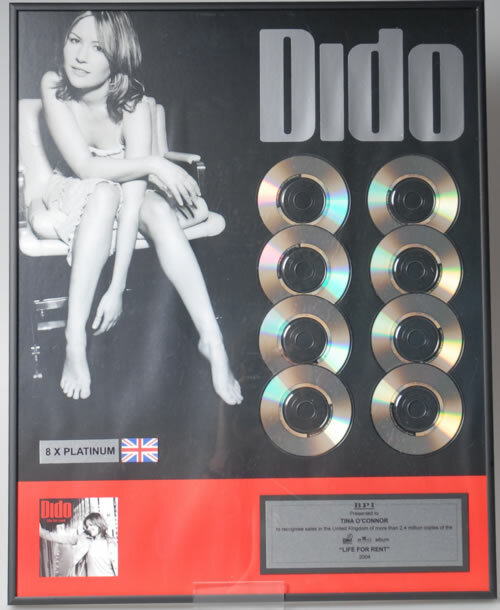 DIDO Life For Rent (Rare official 2004 UK B.P.I. Certified Eight Time Platinum award issued to commemorate album sales in excess of 2.4 Million copies, and presented to Virgin Megastores. This nicely framed and glazed award measures 20"x 16" in size, and features eight 3" Disc's mounted next to a barefoot image of Dido sat on a leather chair in a sleeveless summery dress, mini '8 X Platinum' & Union Flag below and with the album artwork in the bottom left corner, with the authentic custom engraved dedication plaque in the bottom left corner, all in a black metal frame). or visit our Dido image gallery.